June 23rd 1868; Christopher Latham Sholes received a patent for an invention that he called a "Type-Writer." Born on February 14, 1819, in Mooresburg, Pennsylvania, Christopher Latham Sholes moved to Danville, Pennsylvania, as a teenager. It was here that Sholes learned the printer’s trade by working as an apprentice to a printer. At age 18, Sholes relocated to Green Bay, Wisconsin, joining his 2 brothers; Henry and Charles. Sholes was editor of the Wisconsin Enquirer for a short while before relocating to Kenosha, WI in 1845, to become editor/publisher of the Southport Telegraph which he continued to publish for 17 years. He also dabbled in politics; serving in the Wisconsin Senate from 1848-1849 and 1856-1857 and in the Wisconsin State Assembly from 1852-1853. Sholes served as postmaster in Milwaukee during the Civil War and later as port collector and as commissioner of public works. Sholes is known for being an active inventor and developed several devices during his newspaper career. Less known inventions include a paging/numbering device created in 1864 and a newspaper addressing machine. 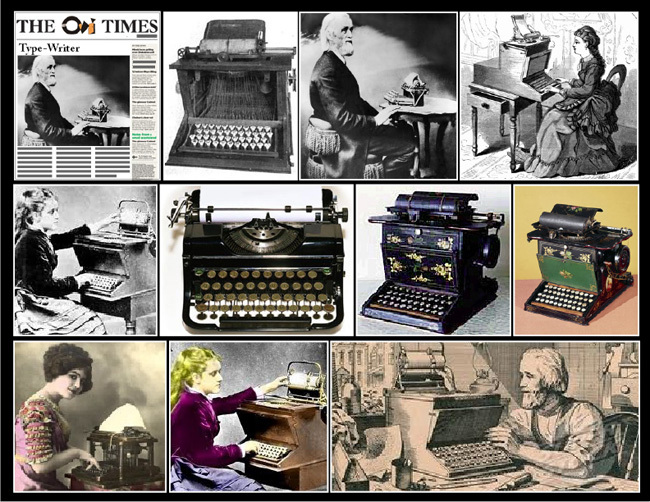 These devices helped Sholes to develop the first practical typewriter in 1867. To create the typewriter, Sholes worked closely with Carlos Glidden and Samuel W. Soules. The three men were granted a patent for this device on June 23, 1868. Sholes, himself is credited with inventing the typewriter keyboard layout, known as QWERTY because of the first six keys ordering in the third row. The ordering was created to separate the most common two letter combinations used in English so that typists would encounter less typewriter jams. Since its invention, QWERTY has also become the most common modern-day keyboard layout on English-language computers. By 1872, the model had been perfected although letters needed to be typed in capitals and there was no number one key. Shortly after this time, Sholes sold the copyright to the Remington Arms Company for $12,000 and the machine was first marketed as the “Sholes & Glidden Type Writer” in 1873. Less than 5,000 machines were sold but Sholes continued to work on advancing the device. In 1878, Sholes had created a shift key so that both lower and upper case letters could be used. The advanced machine, “Remington No. 2” became a huge success after another decade on the market. Sholes spent his later years of retirement in Milwaukee and passed away on February 17, 1890. He is buried in the Forest Home Cemetery in Milwaukee.